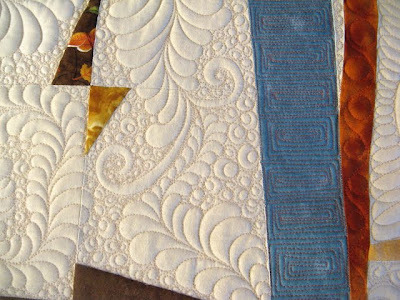 I hope you enjoy going back to look at one of my favorite quilting projects - and forgive me for not having new quilting pictures to share. I spent all of last week trying to figure out what was "wrong" with my quilting machine. My thread was breaking every two inches and I did everything I knew to fix it. I called my dealer Jen everyday last week and we both finally narrowed it down to an overused rotary hook - I guess I quilt quite a bit - anyway the part is shipping to me this week, then I will get it on the machine and start again. I feel like everything is keeping me from quilting and I am getting farther behind. If you are on my schedule - please forgive me - I am doing my best. Quilting is just stunning. I love that quilt too!! No worries, you have so much going on. Just enjoy each day! Will you please post if that was indeed the problem with your machine? I love you, Judi! Were your ears burning today with love, I was thinking about you all afternoon but work was crazy and I couldn't break away. I have a little fun for you when I come back from my trip! I miss you and hope we can do a Christmas lunch next week!!!! even if it is putting you behind waiting for the part this gives you a break - as a new mommy I bet you need this break (especially seeing as you have other little ones too! )if you can take a couple naps, bake some Christmas cookies and enjoy the time until you get the part and back to work! I just discovered your blog and web-site a few days ago, and I have read (and viewed!) almost every blog entry since you began blogging. All I can say is WOW! I love your quilting, it is amazing, and your posts are full of fun. Congratulations on the birth of your son and enjoy the holidays. I look forward to seeing and hearing more from you.